Australian researchers are helping NASA to obtain new information on the evolution of our solar system, with the help of a specialised experimental setup at the Australian Synchrotron. It might sound like a sci-fi fantasy concept, but the solar wind is simply a stream of charged particles, mainly ionised hydrogen atoms, that flow outwards from the sun, travelling at around 500 kilometres a second. Knowing more about the composition of the solar wind will improve our knowledge of how the solar system was formed. Scientific evidence suggests that the outer layer of the sun has not changed much since it was formed about 4.6 billion years ago, and its composition is closely related to that of the solar wind. Comparing the composition of the solar wind with what we know about the composition of planetary systems should provide new information on the evolution of our solar system and its planets. The NASA Genesis spacecraft was launched in August 2001 and orbited the sun, collecting solar wind atoms travelling at such high speeds that they became buried below the surface of specially designed silicon, diamond and sapphire wafers. One of the mission's key goals was to use these samples to measure the fluence of the solar wind, i.e. the number of particles that flow through a given cross-sectional area. However, terrestrial contamination caused when the spacecraft crashed on re-entry in 2004 has created additional challenges for researchers. 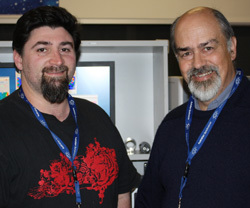 In August 2010, Bruce King and Michael Gladys from the University of Newcastle brought sapphire solar wind samples that had flown on the Genesis spacecraft to the Australian Synchrotron for specialised x-ray absorption spectroscopy (XAS) studies. Bruce and Michael worked with Chris Glover on the XAS beamline to establish a new setup for collecting reflectance rather than absorption data. 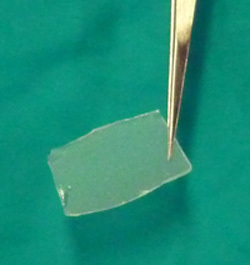 Using a technique called total reflection x-ray fluorescence (TXRF) to determine the surface concentrations of impurities on the Genesis wafer samples, they hoped to distinguish solar wind impurities - present in the near-surface region at concentrations well below one part per million - from terrestrial contamination. The initial TXRF results obtained at the XAS beamline showed the clear benefit of the synchrotron source compared to a laboratory-based instrument. For example, contaminants that were invisible after a two-hour lab-based TXRF measurement were clearly resolved into the different metal components after a few seconds of synchrotron TXRF measurement. This can be attributed to sample setup and greater photon flux, as well as the ability to readily tune the incident photon energy. The researchers chose to use the XAS beamline at the Australian Synchrotron because of its ability to accept different experimental setups. The second experimental hutch at the XAS beamline contains no fixed experimental setups, enabling users to devise a new experiment and providing the time and space needed to construct it. Chris says the experimental setup used for the Genesis samples is analogous to grazing incidence x-ray absorption spectroscopy. "The work with the Genesis samples has got us half-way to realising grazing incidence x-ray absorption spectroscopy for XAS users," Chris told Lightspeed. "We had to set up a lot of stages to finely align the samples, and then deal with the very small background of iron from contamination from scattered x-rays in the hutch. This was quite a challenge, as there's a lot of steel around the beamline! The experience has given us ideas about how to improve sample alignment and deal with iron contamination in the future." Bottom photo: This 11 x 6 millimetre sapphire wafer travelled 32 million kilometres on the Genesis spacecraft. Photo courtesy of Bruce King.